Priceless Heirloom Guitar - Only $5 per Chance! 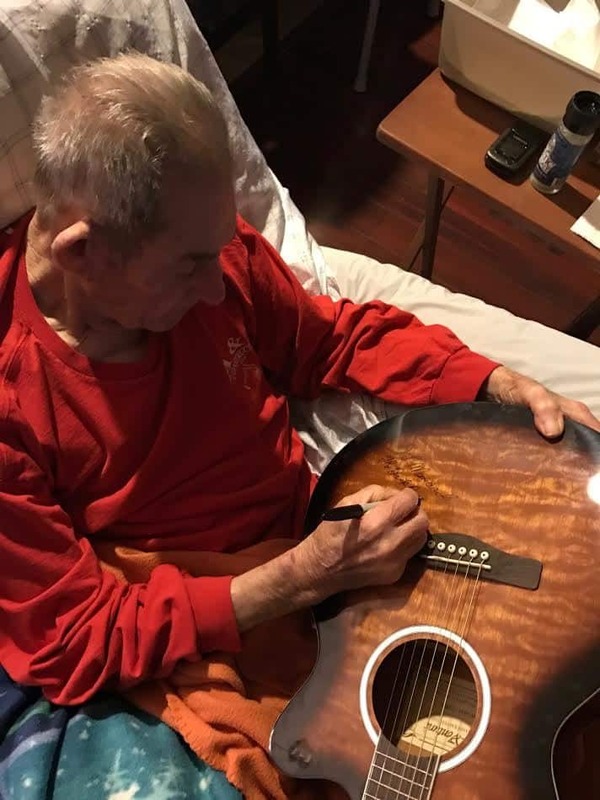 Win a One-of-a-Kind acoustic Guitar autographed by the legendary Cajun Music Artist D.L. Menard. Proceeds to Benefit the CMR Cajun Youth Accordion Program! The one and only D.L. Menard, father of popular Cajun music and artist known for La Porte d'en Arrière (The Back Door) is shown here signing the raffle guitar. The instrument was graciously provided by Mr. Greg Mouton, master accordion maker and musician, who is the proprietor of Mouton Accordions and Mouton Music. The Cajun Music Radio staff sat down to visit with Mr. Menard, who was is high spirits and fine health. Recent health problems had many Cajun music fans concerned. When asked how he was feeling, D.L., ever the jokester, replied with a twinkle in his eye, "Other than being a little wobbly, I feel damn good!" 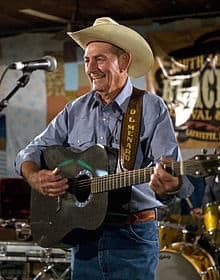 We certainly wish him continued fine health, and want to thank Mr. Menard for being so generous in helping us promote this heirloom guitar raffle. The proceeds of this event will go to benefit the CMR Cajun Youth Music Program. This ongoing program raises funds to award a free accordion, fiddle, or guitar to select young folks who show a strong desire to learn Cajun French music, but that may not have the ability to purchase an instrument on their own. Raffle tickets may be purchased for $5 from any CMR staff member, or by contacting us through the website. You can also purchase raffle chances online using the secure form on this page. This event has ended. Our thanks to all who participated. Congratulations to the winner. A video of the drawing that was held at Le Bal Cadien can be viewed on our Facebook page.